Today Graceland is one of the most visited former private residences in the world. Each year about 600,000 visitors pass through Elvis Presley’s home in Memphis. For 20 years, though, the gates to the mansion were rarely opened to outsiders. When Elvis lived there, it was his refuge from a world that couldn’t seem to leave him alone. What follows is a brief chronicle of Graceland in 1957, when Elvis purchased the estate, built stone walls around it, remodeled it to his liking, and brought his parents to live there. This story has been compiled from 1957 newspaper archives, along with some dates and information from Elvis Day By Day by Peter Guralnick and Ernst Jorgensen. In mid-March 1957, Vernon and Gladys Presley returned to their home in Memphis. They had been in Hollywood visiting their son on the set of his second movie, Loving You. Due to problems caused by crowds of kids hanging around the Presley house on Audubon Drive, Elvis’s parents began searching for a larger, more private residence for the family. It didn’t take long to find what they were looking for. On March 16 they called Elvis, who was finishing up his obligations in Hollywood, to tell him they had found a home they liked. It was a Southern colonial mansion in the city’s Whitehaven district. It was so elegant that it had a name—Graceland. Two days later, Elvis returned to Memphis by train. The next day, Tuesday, March 19, he went out to view the property with his parents. He was shown around by Mrs. Virginia Grant, whose realty company was handling the sale for its owner, Mrs. Ruth Brown Moore. What Elvis saw was a two-story, stone residence, featuring a tall stone-pillared portico at the entrance. A long story in the Memphis Press-Scimitar on March 23, described the interior. “It includes an entrance stair-hall, living room, dining room and parlor across the front that can be opened for entertaining into an area 75 feet long. A big kitchen, pantry, butler’s pantry, utility room, one bedroom and a bath and a half are on the ground floor. Upstairs are four bedrooms and three baths.” The basement featured a wood-paneled den, along with a playroom and two fireplaces. The newspaper described the nearly 14 acres on which the house sat as “beautifully wooded and planted.” The property was all that was left of the original large Hereford cattle ranch founded west of Memphis. In recent decades much of the land had been developed for a housing sub-division and a plaza shopping center. Before putting the property up for sale, Mrs. Moore donated 4 ½ acres of the original property to the adjacent Graceland Christian Church. Elvis had some unusual suggestions for George Golden, the interior decorator the Presleys had hired. “I want the darkest blue there is for my room,” he told the Press Scimitar, “with a mirror that will cover one side of the room. I probably will have a black bedroom suite, trimmed in white leather with a white rug.” He wanted clouds and stars painted on the ceiling of the entrance hall. “I think it would be great,” he said. For the living, dining, and sun rooms, Elvis ordered purple walls with white corduroy drapes. Finally, Gladys, who had listened quietly to her son’s bizarre color scheme, spoke up. She wasn’t enthusiastic about purple walls, she said. Lighter colors were her preference. Elvis also envisioned a “HI-FI receiver” in every room, and a large sunken patio leading out to a swimming pool south of the house. 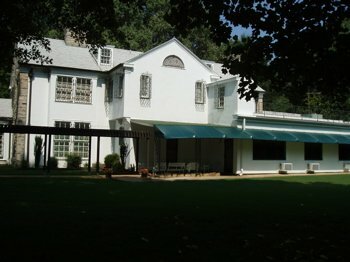 Other improvements on the grounds included expanding the existing four-car garage to accommodate the 10 cars Elvis owned. Also, a six-foot stone fence was planned for the front and sides of the property. 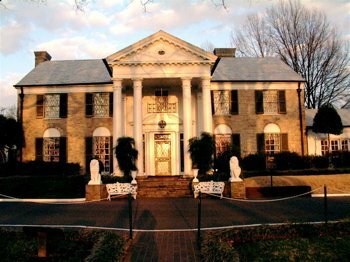 The Press-Scimitar speculated that the “traditional, Southern beauty of Graceland may well have saved Memphis its most famous resident.” Vernon Presley reportedly wanted the family to move to California, but Elvis and Gladys wanted to stay in Tennessee. On March 27, just as the remodeling of his new home was getting started, Elvis left for Chicago to open a nine-city personal appearance tour. While he was gone, painters started working on Graceland’s interior walls and bricklayers began building a brick and stone fence around the property. Elvis’s father sloughed off any responsibility. “We let all the contracts out. C.W. Nichols got the painting contract. I didn’t give the matter a thought. Nichols hired the painters.” Work on the stone fence halted also when the bricklayers refused to cross the picket line. It’s worth noting that at the time Elvis himself was a member of two unions, the Musicians Union and the Actors Guild. On April 15, the day the Presleys had hoped to move into Graceland, they were still living in the house on Audubon. Contractors still had a month’s work ahead of them. On that day, however, Elvis, now back in town after completing his spring tour, visited Graceland and posed for photographers on a tractor he had purchased for use on the property. Two days later, he was posing for photos in front of Graceland again, this time with actress Yvonne Lime, who had come to Memphis to visit Elvis. On April 19 workmen installed the famous iron gates at Graceland. A week later Elvis boarded a train for Hollywood to make his third film, Jailhouse Rock. While he was gone, work on the house’s interior was completed, and Vernon and Gladys Presley finally moved in on May 16. The mansion’s first grand piano was purchased on May 28, and by June 18 the kidney-shaped swimming pool had been installed. His work on Jailhouse Rock completed, Elvis returned to Memphis on June 26 and spent his first night in his new home. Fans and celebrities alike began arriving in Memphis to visit the city’s most famous resident in his new mansion. Singer Ivory Joe Hunter was there on July 30, and on August 7 actress Venetia Stevenson arrived from California for a visit. On August 11 two 19-year-old Minnesota girls got the thrill of their young lives when they met Elvis at Graceland. Helen Magyar and Alice Steinhauer told the Press-Scimitar that after graduating from high school in St. Paul, they had worked for a year to afford their trip to Memphis. After Elvis’s uncle Travis Smith carried their note up to the house, the gates were opened for the girls, who half-ran up the driveway. They found Elvis hiding behind a tree on the front lawn. “We got to do something we had wanted to do for a long time,” said one of the girls. “He let us run our fingers through his sideburns.” The girls gave Elvis a teddy bear, and each received a kiss on the cheek from him. “The girls back home who laughed at us before we left will never believe us,” Alice predicted. On August 27 Elvis left Memphis for a quick concert tour of the Pacific Northwest and some recording work in Los Angeles. He returned to Graceland on September 11. The next morning the Graceland gates were locked because gatekeeper Uncle Travis was in the hospital. While he was recovering, the house behind Graceland where he and his family lived was redecorated. Workers put up new wallpaper and refinished the floor. The two women presented two big baskets of welcoming gifts to Gladys Presley. “We carried gifts from 15 merchants,” explained Mrs. Provost. “Fourteen of them wanted to give something special. The other one said no, they should be treated like any other newcomers.” The gifts included a gold planter, tea-aprons, a sheet and pillow case set, a set of tea towels, and a large ashtray. While the two ladies were talking to Gladys, her son came in to see them. “It was 3 in the afternoon and he was wearing black satin pajamas,” said Mrs. Provost. After presenting Elvis with a teddy bear as a welcoming gift, the women were told it was the 623rd teddy bear Elvis had received. Mrs. Provost told the newspaper that the Presleys were very appreciative of the special welcome they had received from the Welcome Wagoners. Elvis received at least 500-600 letters and usually 2-3 packages each day, according to Burns. “Most of it is from teen-age girls, judging from the lipstick smears and affectionate notes scribbled on the envelopes,” Burns explained. 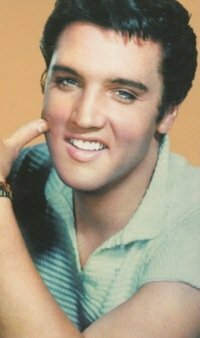 Vernon Presley noted that many amateur composers also mailed songs to Elvis hoping he’d record them. As summer gave way to the Presley’s first autumn at Graceland, Elvis left on October 12 for six weeks of vacation and work. He spent some time in Las Vegas before doing his last concerts of the 1950s on the West Coast and in Hawaii. He was back in Memphis on November 24, only to find the front gates of his home wouldn’t open due to a mechanical problem. Elvis and his buddies had to climb over the wall to get inside. On December 16, as his first Christmas at Graceland neared, Elvis bought a Santa and reindeer display for the front lawn. Four days later Elvis picked up his draft notice. That Christmas would be the only one the Presleys would spend together at Graceland. Elvis’s mother passed away the following August, and the next two Christmas seasons found him in Germany. "Elvis immediately decided that Graceland was 'just the thing' he was looking for and put a $1,000 deposit on the property that was reportedly valued at $100,000."